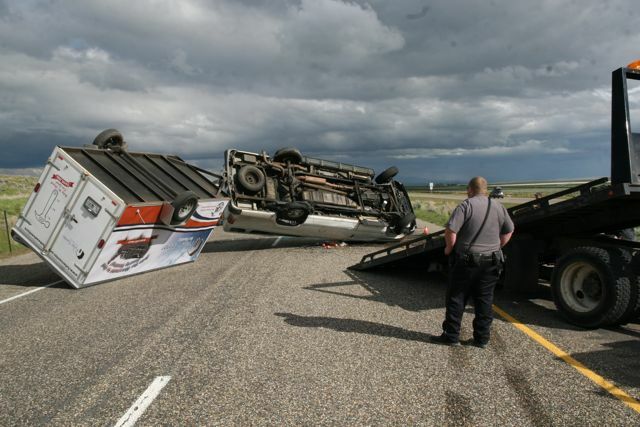 A group of eight Fuller Center Bike Adventure participants were en route from Denver to Boise last night when a tire exploded on the van they were driving, causing both the vehicle and the attached trailer to swerve and flip upside down. None of the passengers, who included Tom Weber, Ashley Rae Moore, Michael Tiemeyer, Krystal Goodwin, Ryan Iafigliola, Allen Slabaugh, Scott Umstattd and Alyssa Hostetler, were seriously injured. The team was on its way to Seattle for the kick-off of the fourth annual Fuller Center Bike Adventure, a 3600-mile journey designed to raise money and awareness for poverty housing. Though no one was seriously injured, each passenger was affected by the accident. Tom Weber, who at 69 is the oldest member of the team, suffered a dislocated shoulder. He will return home to Broomfield, Colo., but hopes to rejoin the team later. Also treated for minor injuries at the Cassia Regional Medical Center in Burley, Idaho were Ashley Rae Moore, and newlyweds Michael Tiemeyer and Krystal Goodwin. The couple met during the 2009 Bike Adventure and were married May 20 of this year. This year’s Bike Adventure is their honeymoon. For Allen Slabaugh, the Bike Adventure team leader, the event was a flashback. On March 2, 2007, Slabaugh was a member of the Bluffton University baseball team whose bus fell from an overpass onto Interstate 75 near Atlanta. Seven people were killed, and seven others were seriously injured in the highly publicized crash. “That was just four years ago, so that’s still somewhat fresh in my mind,” said Slabaugh. “When it started rolling, it felt very similar. Anytime your van rolls, it’s scary. Ryan Iafigliola, the driver of the van, was briefly trapped in the upside-down vehicle before fellow team members were able to free him from the smoldering van. “With all the damage to the driver’s side, for Ryan to be able to make it out was pretty amazing, along with everybody else,” Slabaugh said. The van and trailer were totaled in the accident, along with one one bike. But the majority of the the bikes are relatively undamaged, as the trailer’s door held firm during the crash. “Everyone on the van was calm, cool and collected. And then 10 minutes later, they went into repair mode,” he added. The team currently is trying to acquire a replacement van and trailer. 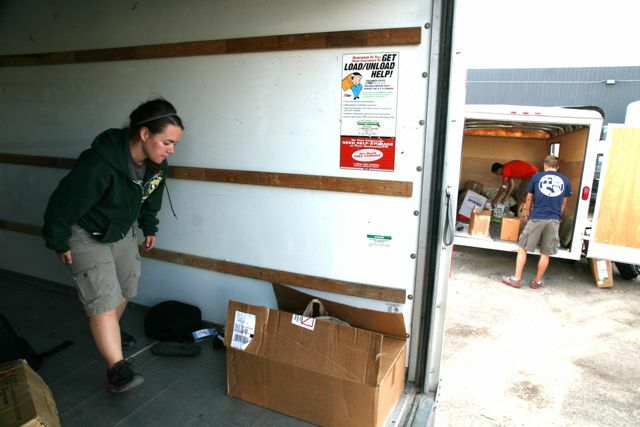 Update (6/10/11): A trailer has been donated! But we still need a van. Click here to contribute toward helping us purchase a new van. Despite this setback, the team is determined to press ahead. This dedicated team needs your support now more than ever.